Are All Cabin Air Filters the Same? More than 90% of new cars and trucks have cabin air filters, but many drivers don’t know it. Cabin filters are usually behind the dashboard or under the windshield and not always the easiest to find. We’ve grown up checking the air filter at each oil change, but not the cabin filter. Cabin air filters didn’t start showing up in cars until the late 1980’s. The cabin filter is designed to filter the air coming into the vehicle’s cabin. It keeps pollutants, dust, and pollen from getting into the air circulation in the passenger compartment. A clogged filter can lead to reduce air flow or bad odors inside your vehicle. 1. Particle (Dust-type) cabin filters – Dust-type filters trap particles that are very small from getting into your vehicle. The best ones snag particles as small as 0.3 microns. By comparison, the width of a human hair is approximately 100 microns. It handles most pollen, mold spores, soot, smoke, tire dust, and bacteria. 2. Activated Carbon Cabin (Combination Dust/Odor) filters – Combination dust and odor filters have an additional element to reduce or eliminate odors, such as activated charcoal. In addition to particle removal, the activated charcoal absorbs harmful gases, fuels, ozone, and carbon monoxide. It also helps prevent mold buildup. There are also versions with anti-bacterial coating for added protection. 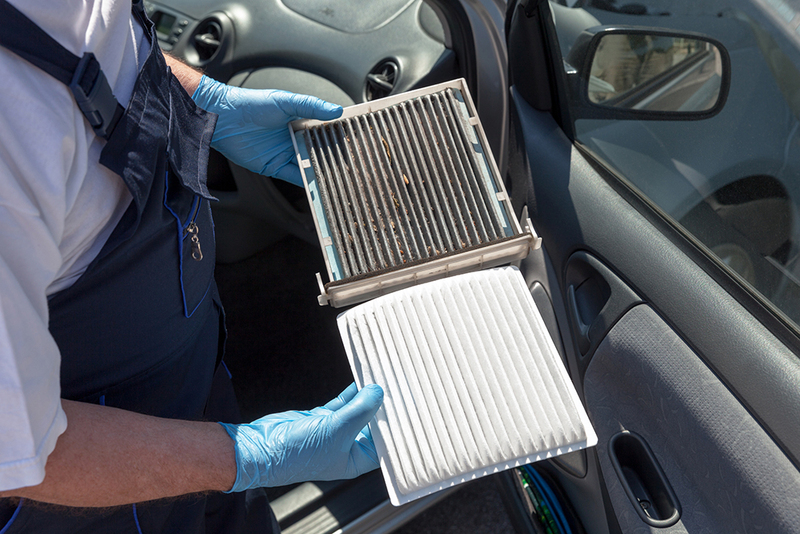 Just like air filters, different vehicles use different cabin air filters. You need to make sure you pick the proper one for your vehicle. You can look up the correct filter for your vehicle using the Premium Guard Filter Look-Up tool. Like most things, you get what you pay for. The smaller micron-rating a cabin air filter has, the better job it will do at filtering out contaminants and pollutants, but the more it will cost. How Often Do I Need to Change My Cabin Air Filter? Your best bet is to check your vehicle’s owner manual for location, type, and recommended cabin filter replacement schedule. A good rule of thumb is to change your filter at least once a year or every 12,000 to 15,000 miles. If you do a lot of driving in urban areas, heavy traffic, or in dusty environments, you may need to change it more frequently. It’s important to change your filter, not just so your car smells good, but filters can get clogged and restrict airflow. Restricted airflow can affect your air conditioner, vents, heater, and defroster. Dirty cabin air filters can also allow mold and bacteria to grow.